Married Name Her married name was Young. Married Name Her married name was Dismukes. Kate (?) married (?) Dismukes. Kate (?) married (?) Young. (?) Dismukes married Kate (?). (?) Young married Kate (?). William Young was the son of (?) Young and Kate (?). John Young was the son of (?) Young and Kate (?). Married Name Her married name was Chambers-Young. Married Name Her married name was Chambers. Peggy Lee Young was the daughter of (?) Young and Kate (?). Peggy Lee Young married (?) Chambers. (?) Chambers married Peggy Lee Young, daughter of (?) Young and Kate (?). Marian Bailey married James A. Croal, son of Francis Andrew Croal and Elizabeth Gertrude Lee. Marian Bailey was born on 19 April 1910. She died in July 1994 at Minneapolis, Minnesota, at age 84. Marian Bailey had zero children. Nickname Dr. James Iver Hovland also went by the name of Jim. Dr. James Iver Hovland was born on 7 February 1934 at Watertown, South Dakota. He was the son of Iver Christopher Hovland and Mary Elizabeth Hicks. Dr. James Iver Hovland died on 24 January 2018 at Sioux Falls, South Dakota, at age 83 Dr. James Iver Hovland, 83, passed into the hands of his Savior on January 24, 2018, in Sioux Falls, SD. Jim's funeral will be held Monday, January 29, 11:00 am at St. Mary's Catholic Church, 2109 S. 5th Ave., Sioux Falls, SD, followed by interment at St. Michael's Cemetery. Jim was born to parents Mary and Iver in Watertown, SD, on February 7, 1934. He grew up and worked on the family farm near Ortley, attended Waubay High School, and then traveled all the way to Northern State College, where he met Marie Beshara, the ever-lasting love of his life, whom he married in Deadwood in 1958. After graduating from KU Medical School and serving residencies and internships in Missouri, he returned to Aberdeen to begin a decades-long mission of service as an OB/GYN specialist. He delivered thousands of children to the world and provided gentle care to every patient who entered his office. Jim's greatest source of pride came from his wife: Marie; his grandchildren: Maria, Ethan, Isaiah, Ben, Sam, Tom, Erik, and Iver; and his children: Kathleen, Marie (Dennis), Mike (Deanna), and Tom (JoAnn). Jim's loving sister, Mary, and her children Karen, Tom, Bill, and Robert, will also miss his straight face and incisive, always entertaining commentary. Thomas E. Lund married Helen (?). Thomas E. Lund was born on 17 March 1934. He was the son of Clarence Victor Lund Sr. and Katherine H. Hicks. Thomas E. Lund died on 6 January 2008 at Manteca, California, at age 73 Thomas E. Lund passed away Jan. 6, 2008. Viewing: Mon. Jan. 14, 11-1 p.m, P.L. Fry & Son Funeral Home, 290 N. Union Rd., Manteca, CA. Services will follow view, 1 p.m., P.L. Fry & Son Funeral Home. Burial: Park View Cemetery on French Camp Rd. Married Name Her married name was Lund. Helen (?) married Thomas E. Lund, son of Clarence Victor Lund Sr. and Katherine H. Hicks. Helen (?) died before 2008. John Robert Lund was born on 31 July 1939 at Downers Grove, Illinois. John Robert Lund died on 27 December 2005 at Park Ridge, Illinois, at age 66 John R. Lund, Veteran U.S. Army, loving father of Cathy (Don) Santelle and Ross (Rochelle) Lund; fond grandfather of Danny and Christie Santelle; dear brother of Tom (Helen), Charles (Mary) and the late Vic (Barbara Cockshoot) Lund; fond uncle of many. Funeral Friday, 9 a.m. from Severino's Riverwoods Funeral Chapel, 205 S. River Rd., Des Plaines (2 blks. N. of Rand Rd., Rt. 12), to St. Alphonsus Liguori Church. Mass 10 a.m. Interment Assumption Cemetery, Wheaton, IL. Visitatiom Thursday, 3 to 9 p.m. Member of K of C, usher at St. Alphonsus Liguori Church. Nickname Clarence V. Lund Jr. also went by the name of Vic. Clarence V. Lund Jr. married Barbara (?). Clarence V. Lund Jr. was born circa 1933 at Illinois. Clarence V. Lund Jr. died before 2001. Barbara (?) married Clarence V. Lund Jr., son of Clarence Victor Lund Sr. and Katherine H. Hicks. Maryann (?) married Thomas Lee Croal, son of Lee F. Croal and Bernice Maude Monroe. Maryann (?) died before 2007. Lisa Croal was the daughter of Thomas Lee Croal and Maryann (?). Lisa Croal died before 2007. Married Name circa 1955 As of circa 1955,her married name was Reid. Elizabeth Ruth Croal was born on 5 June 1930 at Minneapolis, Minnesota. She was the daughter of Lee F. Croal and Bernice Maude Monroe. Elizabeth Ruth Croal married Norm Reid circa 1955. Elizabeth Ruth Croal died on 16 December 2017 at Minneapolis, Minnesota, at age 87 Reid, Elizabeth Ruth (Croal) Liz Reid passed away quietly on the morning of December 16, 2017, surrounded by family at Rakhma Peace Home in Minneapolis after a long battle with Alzheimer's. She was 87. Born Elizabeth Ruth Croal on June 5, 1930, in Minneapolis, Minnesota, to parents Lee and Bernice Croal, Liz had a preternaturally upbeat disposition despite a sometimes harrowing childhood that found her supporting and caring for siblings Jane, Tom and Frank while still in her early teens. Possessed of a boisterous laugh and a radiant smile, Liz was always ready to share either at moment's notice. Graduating from high school in rural Madison, Minnesota, Liz earned a scholarship to Macalester College and later transferred to the University of Minnesota where she met her future husband of 62 years, Norm. Graduating from the U of M as a Physical Education teacher and aquatics enthusiast, she turned her teaching skills onto her seven children with Norm in the Minneapolis suburb of Crystal, where she became a passionate advocate for education, parks and people. Promoting the planning and development of local projects like the Crystal municipal pool complex and Becker Park, Liz was a longtime volunteer organizer and co-founder of the annual summer festival, the Crystal Frolics. Liz earned many honors and accolades for her community service including a 2006 Minnesota Parks and Recreation Association award honoring her 25 years of service to the community. She was also active in local politics, organizing for school board elections and congressional candidates. Doing the work for the good it would do and not the accolades that would accrue, worker-bee Liz was always an unsung hero who made the community better every day by doing whatever was necessary to make change happen. Liz was a lover of swing music, antic novels and family camping trips. An avid gardener for whom working the earth was the best solace and sanctuary, her flower beds and shrubs provided welcome spring and summer eruptions of color - and a good excuse to share plants, stories and her love of gardening with friends and family. Sharing, caring and community - persistent themes in the lifesong of Liz Reid. Preceded in death by husband Norm and brothers Thomas and Francis, Liz is survived by sisters Jane, Karen and Judy as well as by her 7 children, Michael, Jeffrey, Nancy, Robert, Thomas, Charles and Wendy, along with 8 grandchildren and 2 great-grandchildren. Norm Reid married Elizabeth Ruth Croal, daughter of Lee F. Croal and Bernice Maude Monroe, circa 1955. Norm Reid died before 2017. Edward Cummings married Anna E. Prunty, daughter of Patrick Henry Prunty and Anna Nancy Hafner. Edward Cummings was born on 21 June 1879 at Wisconsin. He died on 23 February 1962 at Wisconsin at age 82. James Joseph Cummings was born on 5 July 1927 at Wisconsin. He was the son of Edward Cummings and Anna E. Prunty. James Joseph Cummings died on 18 June 1990 at Wisconsin at age 62. Married Name Her married name was Hicks. Frances (?) married John A. Hicks, son of Dr. Thomas H. Hicks and Anna Croal. William J. Riedel was born circa 1871. He died on 27 September 1931. Frederick Bohan died after 1946. Thomas Croal was born circa 1924. He was the son of Thomas Francis Croal Jr. and Olive M. Maas. Thomas Croal died before 2016. Married Name 1941 As of 1941,her married name was Duffey. Married Name 1983 As of 1983,her married name was Pieh. Agnes Cecelia Cawley was born on 5 September 1916 at Madison, Dane, Wisconsin. She was the daughter of Michael J. Cawley and Mary A. McCabe. 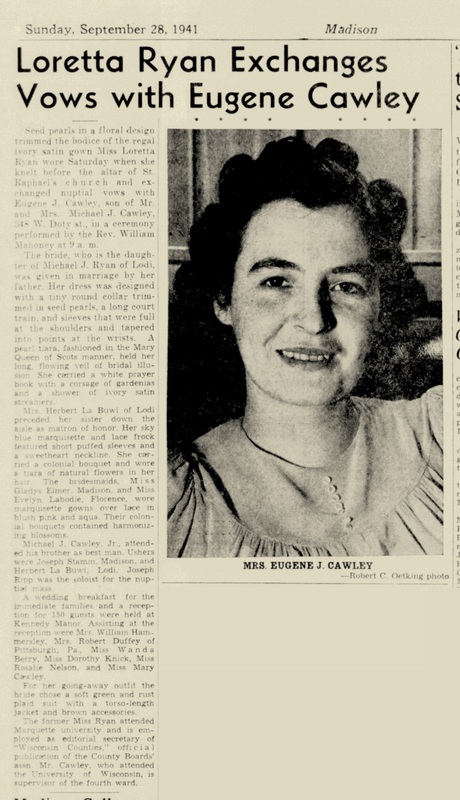 Agnes Cecelia Cawley married Robert Duffey in 1941. 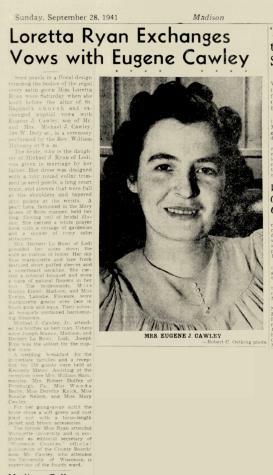 Agnes Cecelia Cawley and Robert Duffey were divorced in 1953. Agnes Cecelia Cawley married George Pieh in 1983. Agnes Cecelia Cawley died on 11 August 2015 at Wisconsin at age 98 Agnes Pieh, 98, of Madison died peacefully at Capitol Lakes Retirement Center as a result of Alzheimer’s and natural causes. To the very end, she was upbeat, funny, and never gave up her zest for living. She leaves us with a legacy of faith, lessons of perseverance, dedication to family and children, trust in God and humor. Agnes was born in Madison on September 5, 1916 to Michael and Mary (McCabe) Cawley. She attended St. Raphael’s’ Catholic School and Madison Central High School. 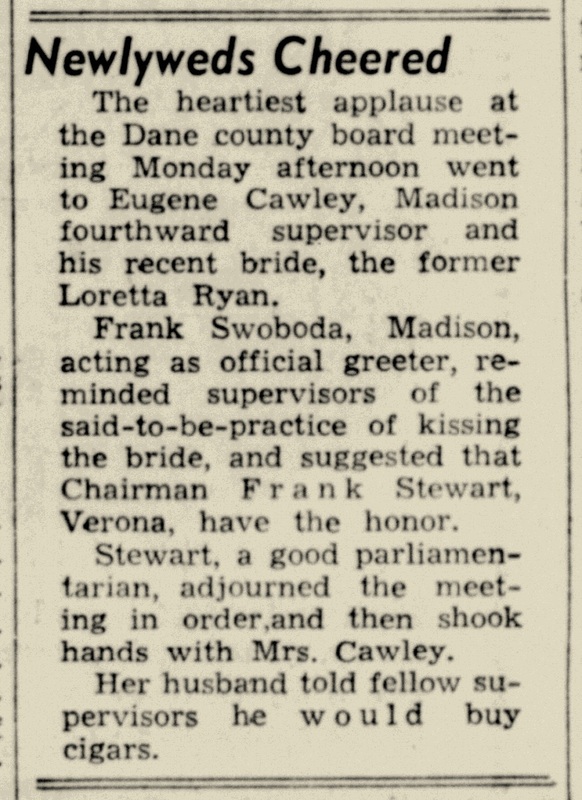 She attended the University of Wisconsin and met Robert Duffey whom she married in 1941. They lived in Pittsburgh, PA, where Robert was Manager of a dairy and ice cream maker. It was in Pittsburgh that they welcomed their first daughter, Sally. With an opportunity to come back to Madison, Agnes and Robert settled into an apartment near the University of Wisconsin campus and his work. Agnes resumed her life with many childhood and high school friends, joining community groups, and participating in a favorite activity of bowling. She joined a team of former high school friends and they were known for their skill, fun, costume attire for events and many championships. During this time, their family grew with the addition of a daughter Jane, and two sons, Robert and James. Their marriage ended in 1953. Agnes devoted her life to raising her family and being employed by the Wisconsin State Workers Compensation, Department of Workforce Development. In her position, she also actively represented employees in workers employment contract negotiation and was on many boards and committees. She was actively involved in church life at St. Raphael’s’ Cathedral, especially with the Ladies Altar Society, serving many lunches and receptions plus contributing her famous fudge to the fund raisers. In later years, she renewed a childhood friendship with George Pieh, widowed from his wife Mercedes, who was also a friend of Agnes and bowling partner. Agnes and George married at St Raphael’s’ Cathedral in 1983 and enjoyed many years travelling and joining in the family weddings, births and celebrations of their extended families. During their married life George and Agnes enjoyed the friendship and activities of the Elks, where George was a prominent leader. They joined in many trips and conventions plus the full social calendar and fund-raising activities of the Elks Lodge in Madison. Agnes is survived by her deceased husband George Pieh; her four children, Sally Beyer-Woodcox, (Keith Woodcox)Dallas, TX., Jane Addison, Marietta, GA, Robert Duffey (Jennifer Dwight), Pleasant Hill, CA, and James (Mary) Duffey, Denver, CO.
She received great pleasure in her grandchildren and would ask everyone who visited her to look at their photos, tell stories about them and greatly delight in each child. Agnes is survived by seven grandchildren, Kurt (Kelly) Beyer, Melbourne, Australia, Stephanie Beyer, Austin, TX, Karsten (Michele)Beyer, New York, NY., Sean Addison (Shannon Green), Arlington, VA., Ryan (Sarah) Addison, Denver, CO, Kaitlin Duffey, San Francisco, CA, and Connor Duffey, Denver, CO.
Four great-grandchildren also survive Agnes and include Madison Ellis Beyer, Melbourne, Australia, Carter Addison, Arlington, VA, Brady Addison, Arlington, VA, and Benjamin Addison, Denver, CO. The family wants to acknowledge Mary Schil, a devoted family friend who was part of our family and loved by Agnes. We also want to thank George Austin and Marty Vukelich-Austin, long-time friends and part of our extended family, for their attention and love for Agnes, especially in her later years and for being our presence when we all live so far away. We thank the staff at Capitol Lakes for their gentle and professional care and attention to Agnes and for their appreciation of her always cheerful spirit. She enjoyed her later stages because of their constant care and devotion. The family is also very grateful to Agrace Hospice for their dedication to Agnes through many health events over the past few years. They provided personalized and loving care and were always available to support her children through each medical event. A Mass of Christian Burial will be at 2 p.m. on Monday August 17, at ST. PATRICK CATHOLIC CHURCH, 404 E. Main Street, with Father Jay Poster, Celebrant. There will be a visitation with the family beginning at 1:00 PM until the time of Mass. Burial Services will follow in the Chapel at Resurrection Cemetery. Robert Duffey married Agnes Cecelia Cawley, daughter of Michael J. Cawley and Mary A. McCabe, in 1941. Robert Duffey and Agnes Cecelia Cawley were divorced in 1953. Married Name Her married name was Stamm. Mary Cawley was the daughter of Michael J. Cawley and Mary A. McCabe. 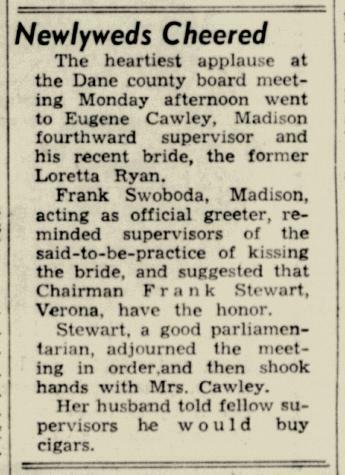 Mary Cawley married Joseph Stamm. Joseph Stamm married Mary Cawley, daughter of Michael J. Cawley and Mary A. McCabe. Joseph Stamm died after 1960. Eugene John Cawley was born on 30 May 1909 at Madison, Dane, Wisconsin. He was the son of Michael J. Cawley and Mary A. McCabe. Eugene John Cawley married Loretta Rose Ryan on 27 September 1941 Loretta Ryan and Eugene Cawley marriage announcement. Eugene John Cawley died on 13 March 1988 at age 78. Michael Cawley Jr. was the son of Michael J. Cawley and Mary A. McCabe.